The Kentucky Derby is a truly American tradition. The oldest continuous sports event in the country is 2 weeks of horse racing. It is then followed by the actual Kentucky Derby Race, which some consider to be the most exciting 2 minutes in sports in the country. 3 year old thoroughbred horses race around a 1.25 mile (2 kilometres) track to win the coveted title. The first race was held in 1875 and it only grew in popularity. By the 1950s it was being aired on television and more people started to get Derby fever. If you are planning on going to derby remember there are several sitting options. First is the infield, which is the cheapest and most crazy. The second is the band stands, which is a little more classy. Then third is the boxes where you can get a glimpse of old southern culture with women wearing amazing hats! So get your mint juleps ready and your bets in because anyone can enjoy derby. Betting is what people usually do at a horse race. The minimum bet on all races is 2 dollars and depending on the odds affects how much you win. Remember that the odds can change up to when all bets are closed. Programs can be purchased for $5 at the entrance and well worth it if you plan to gamble. There are three simple options for betting. The first is to bet to "Win" which means the horse has to win, this gives the highest returns. The second is to bet "Place" which means the horse will come in second place, and has different odds than to win, you still win a small amount if the horse wins. The third option is to bet for the horse to "show." This means the horse comes in either 1st, 2nd or 3rd. The amount of winnings is different depending on where the horse falls. Beyond these three the different kinds of betting get very complicated and should only be done by someone that knows how betting works. Examples of these more complicated bets are trifectas, exactas and first-seconds. Remember all bets close 2 minutes before the race. 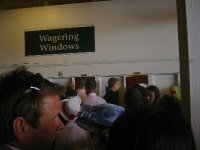 The general edict for betting is to have your bets ready before you go up to the window in order to make it go quicker. When at the wagering window state the number of the race, the amount of the bet then the number for the race. If you have winnings hand that ticket in first before doing anything, they will just deduct it from your next bet. For the latter races there is more time among them in order to give more time for betting. When looking at the program a lot of information is given. Look at the key to figure it out. Just remember the recent article proving you're just as likely to win if you go on a silly horse name as betting on the numbers. Many people have derby pegged as a classy affair with men in suits and women in amazing dresses with hats. It is this way in the bleachers, stands and boxes - not in the infield. This is a muddy all day party, so don't wear nice clothing; and girls, don't wear heels. If you want to experience the nicer and classier side of derby with more affordable tickets, only $60, that anyone can buy for the bleachers then attend the Oaks the day before. This is one of those interesting events where people from every class of society can see each other and interact in a small place. Porto-Pottie Running has become a common activity at derby in the infield. This activity is advised against because it can get you arrested and kicked out of the race. Also as people run along the tops of the porto-potties people throw things at them like beer bottles and chairs, which can hurt. Even while waiting in line at the porto-potties pay attention because it is easy to get hit by debris being thrown at runners, some watchers have even lost a tooth. Drinking is one of the big activities at the race at all different class levels. In general remember this is a marathon not a sprint. Drink slowly all day and have plenty of water with food. The actually derby race is on the first Saturday in May. 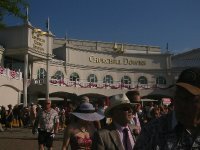 Over the two weeks preceding the race, there are a series of horse races leading up to the main event at the Churchill Downs. The day before is the Kentucky Oaks race, which is also lots of fun. 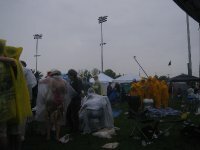 It is possible to enter the infield as early as 8am, although some people line up as early as 5:00am. The actually derby race is not till the early evening around 6pm depending on the year. The cost really depends on where you sit, how much you drink and how much you bet. If you're a good horse better then you can actually make money! Although very few people can do this. General admission is $40 for Derby and can be bought at the entrance to the tunnel with cash or visa, but with more cash lines it is much easier and quicker to pay in cash. This ticket includes access to the infield the ground floor paddock area. It does not give access to a seat or track admission. Track admission is additional $110 for Derby. A two day ticket, including the Oaks, with track access costs $175. Remember the general admission area can get a bit crazy. 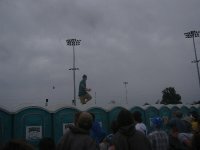 Events such as running the top of the porto potties or drinking till you can't stand are quite common. Be prepared for a wild and crazy time in the infield. Outside of general admission the event becomes very high class. Men in very expensive suites accompanied by women in amazing dresses and hats. In order to sit in this area you have to apply and be prepared to pay. The application website is here. Most of the activities within the downs are cash only. This includes food, beverages, souvenirs and gambling. Temporary ATM's are installed in large numbers all over the downs for the Derby, including the infield. There is a large bank of ATM's, surprise surprise, near all the wagering windows. Churchill Downs is located outside of Louisville and is best reached by car. Most people in large groups arrange school buses or other transport. Taxis are a good option and there are plenty to take you home but will be more expensive then on a normal day because its derby. There are train yards near the track but it is mostly high end tourist trains part of tourist packages. 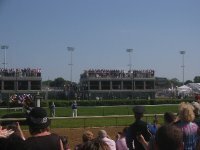 Parking by the downs is expensive during the derby and private houses around the track sell parking for $20 to $30. You can even reserve spots if you know a house. Public transport options are not that great for getting to the Derby. In the downs themselves there are plenty of eating options. This ranges from outlets of local fast food joints to people selling carnival food. It is possible to bring a cooler in with food so remember that option to save money. Also coolers make a great place to sit to devoid the mud on a rainy derby. Outside of the track the houses near the Churchill Downs set up grills and sell everything from water to ribs for reasonable prices. The further from the downs the cheaper this food becomes. So if its getting close to the time to leave just wait a grab some tasty home southern cooking on the outside. It's not a day at the derby without a Mint Julep in special collectors glass for $10! Beers are usually $8. Water and soda run for $4. All accommodation for the event is located in the nearby city of Louisville. In the city there are plenty of different options of accommodation ranging from the super nice to the cheap. This is version 12. Last edited at 9:03 on Mar 17, 17 by Utrecht. 4 articles link to this page.